The State Council of Education, Research and Training (SCERT), Sikkim has initiated plans to insert the much needed concepts of peace, sustainable development and global citizenship in the text books of core subjects for different schools in Sikkim. The Sikkim HRD Ministry has signed a partnership agreement with UNESCO Mahatma Gandhi Institute of Education for Peace and Sustainable Development (MGIEP), along with a third party alliance of Ajim Premji University, Bangalore. The project is an attempt by the Education Ministry of Sikkim to introduce concepts of sustainable development, global citizenship and peace in the textbooks of subjects such as Mathematics, Language, Science and Geography. 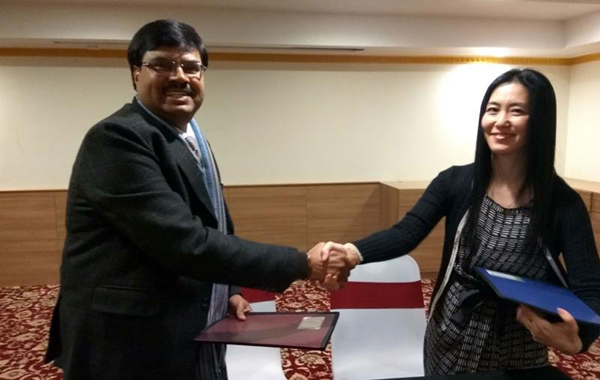 G P Upadhaya, HRD Principal Secretary and Yoko Mochizuki, UNESCO MGIEP curricular head signed the agreement to implement the plan in Sikkim on February 19. An official statement released by the ministry states that, with the implementation of the plan, Sikkim will become one of the first states in the country to have schools dedicated to Education for Sustainable Development (ESD) and Global Citizenship Education (GCED). “About close to 45 research teachers are currently being trained for the project. We are also in the process to adopt and pass the Sustainable Development Act. Considering the impact it will have on the future generations, it has become crucial to have SDGs embedded in to school education.” Upadhaya said. Sustainable development goals will be incorporated in the school curriculums for classes 1-5. Although Education for peace, sustainable development (ESD), Global Citizenship Education (GCED), Global Learning, Development Education and Awareness Raising (DEAR), Human Rights Education etc have existed in schools of other countries, it is the first time such an initiative has been taken up by an Indian school.